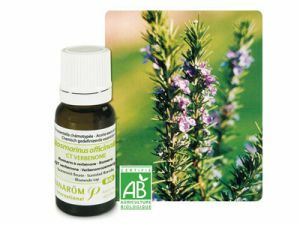 Rosemary is a vigorous perennial plant with grey-green, needle-shaped leaves and whitish to blue flowers. It thrives in a marine climate. Its geographic origin determines its biochemical composition to a large extent. anticatarrhal, mucolytic • cicatrizant and skin renegerator • cardiac and nervous regulator • hepatocyte regenerator and hepatobiliary drainage • important endocrine regulator • lipolytic. Internal : 2 drops under the tongue in the morning, on an empty stomach, in honey, olive oil or a lump of cane sugar. External : 3 drops CTEO + 2 drops hazelnut oil; on the solar plexus or the inner side of the wrists or plantar arch (repeat as needed). The rosemary verbenone supplies a remarquable essential oil to purify the organism. During the months of March and September a treatment of a 3 weeks cure consisting in putting 2 drops on 1/4 lump of cane sugar and letting melt in the mouth every morning can be followed.